Ricardo Tubbs and Sonny Crockett are both working undercover in the heat of Florida, penetrating the dark, dollar-fuelled abyss of the drugs world. But as the temperature soars in Miami, Sonny gets romantically involved with Isabella, the wife of an arms and guns trafficker. Crockett and Tubbs are gradually pushed to the edge and suddenly the distinction between cops and player becomes dangerously blurred. Nobody likes “Miami Vice” when it was released in the theaters, not the audience and not even the critics has a penchant for it too. So what’s wrong with this Michael Mann’s crafted crime thriller? Shot in HD and filled with hand-held shots to enhance the realism on the whole, “Miami Vice” has the look, feel and even breath liked those reality TV programs. Perhaps of this factor, audience is being ironically left out instead of being allure to it. We are so used to the notion of watching movies, however to spend 132 minutes “in” a movie is simply sacrilegious. 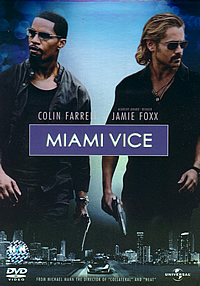 Chemistry issue aside, no doubt the idea of pairing up Jamie Foxx and bad boy Colin Farrell is cool. But way too cool at times makes them appear aloof, distance. Yes they are bad boys with a bad attitude equipped with bad guns and a nice cool Ferrari but they are no match as compared to say, the wacky bad boys, Will Smith and Martin Lawrence. Supposedly based on the original, cheesy television series of the same name and produced by Mann in the early 80’s, the movie version takes Ricardo Tubbs and Sonny Crockett undercover to penetrate the world of a massive drug-lord. One of Asia’s most veteran and voluptuous actress, Gong Li appears here as the wife of the drug-lord. A role that requires little of Mrs Gong’s renowned acting strength but goes to prove that she can sizzle and fizzle the screen with the much younger Colin Farrell minus the awkwardness. This time round, it’s more of a miss than hits for Michael Mann who helmed the excellent “Collateral”. A strong visual experience on the whole but the less than captivating plotting and uneven pacing makes this a vice to pick it up. There's no deleted scenes or commentary track here, just two short featurettes and a MTV in this edition. Miami and Beyond: Shooting on Location - A 10 minutes segment that brings you on-location with Michael Mann and his crew. Kudos to Mann for having the courage to shot on-locations rather than soundstages. Miami Vice Undercover - If you like "Crimewatch", you might love this. Featuring interviews with real undercover Miami cops and their frank feelings about their jobs. The dolby digital 5.1 mix is excellent. Listen to the rounds being pumped and get ready to dodge. The movie itself consists lots of nightshots and in some parts, grainy and blurrish. Perhaps it's due to the handheld shots or Mann's intention to give it a sense of realism. Not the best disc to showoff to the laymen however there's a certain raw beauty to it which a certain group of audience might appreciate.